The ability to peer at molecular processes as they unfold in vivo can deliver invaluable insights to researchers. Molecules that shuttle through living cells are often vital biomarkers of disease conditions, and capturing tiny quantitative changes in their levels is an essential part of diagnosis in the era of precision medicine. What’s more, dynamic monitoring of physiological changes can also help track and adjust drug treatments during preclinical studies. In order to get a bead on key molecules that signal disruptions in regular cell functions, scientists need to cast a wide net. MRI, PET, and CT imaging are useful tools to visualize and measure cellular processes, but they are vastly more expensive than light-based imaging techniques. 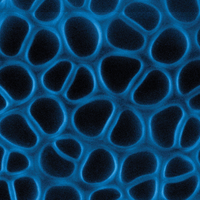 A variety of fluorescent probes are available to detect specific molecules and monitor their activities. 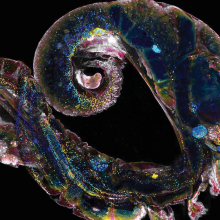 But optical imaging in living animals has mostly been limited to the study of skin, eyes, surface vessels, and epithelial tissues accessible to visible light. 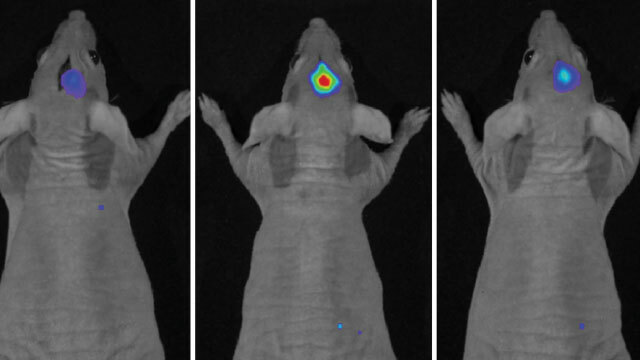 In recent years, however, investigators have been developing probes that work in the near-infrared range—longer wavelengths that allow visibility into deeper tissue layers. 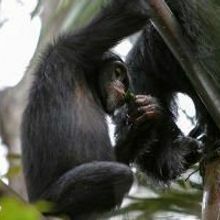 The Scientist spoke with some of these researchers about how they designed noninvasive probes to capture real-time, in situ changes in living animals. Problem: Reactive oxygen species act as essential signaling molecules at low concentrations, but free radicals wreak havoc when their levels shoot up in tumors and inflamed tissues. 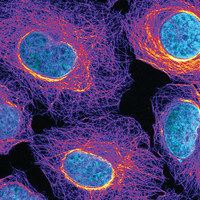 Several probes measure hydrogen peroxide (H2O2) levels in cell culture, but they are obscured by autofluorescence when used in vivo. Current probes designed for live imaging rely on small-molecule dyes that are unstable in the presence of hypochlorite and hydroxyl radicals, which are highly reactive. “Detecting peroxide in living animals is challenging, and you need to have a sensitive probe with the ability to pass through thick tissues,” Pu says. Solution: Pu and colleagues developed a chemiluminescent probe that detects peroxide at levels as low as 5 nM (normal in vivo levels of H2O2 are closer to 100 nM). 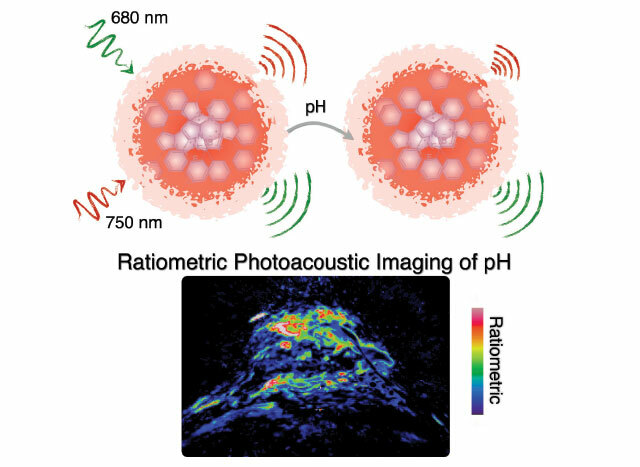 The probe relies on a reaction between H2O2 and peroxalate to chemically excite a luminescent reporter, eliminating the need for external light excitation, which in turn eliminates autofluorescence. “This design kind of minimizes the tissue penetration problem, and sensitivity is higher when you don’t need any external light source,” says Pu. 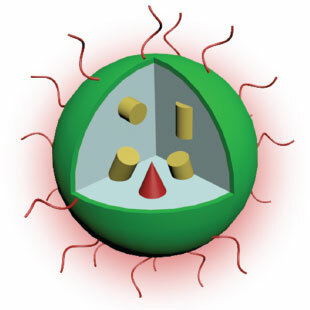 The probe sits inside semiconducting nanoparticles that are stable in the presence of free radicals, and it emits in the near-infrared range, which allows the emitted light to be detected even through the skull (ACS Nano, 10:6400-09, 2016). Limitations: The probe’s current iteration can’t reliably home in on the tissue of interest. The best way to ensure that the nanoparticles accumulate in a specific location is to inject them directly into the right spot. Future Plans: Pu and colleagues are working on targeting strategies and are trying to reduce the probe size to ensure better accumulation and biodistribution. Expert Tip: The probe is more stable than others out there, but for best performance, stick with fresh preparations, Pu says. “If you leave it out for one day, many substrates get consumed,” he adds. Purge the buffer with nitrogen, dissolve the freeze-dried probe in it, and use immediately. Problem: pH is a physiological index that remains near neutral under normal conditions. In inflammation-related diseases, however, the tissue environment turns acidic. “If you can map the pH in disease, it can help to do better drug screening,” Pu says, explaining that knowledge about the pH environment is useful for drug design. But most current probes designed to measure pH are based on fluorescence, which is often hampered by strong light scattering and tissue auto?uorescence. Solution: Pu and colleagues developed a probe that detects pH in a ratiometric manner. The unique thing about this probe, Pu says, is that it is photoacoustic. “It’s basically a light-in and sound-out process,” he says. When researchers use a laser to target a tissue of interest, part of the energy gets converted into heat, leading to tissue expansion. The expanded tissue emits ultrasound waves that can be recorded. This imaging technique allows researchers to maximize signal-to-noise ratios and easily detect signals through tissues as thick as 6 cm. “In addition, it measures linearly,” Pu says. “When the signal is high, the pH is high, and when the signal is low, the pH is low” (Adv Mater, 28:3662-68, 2016). Limitations: Despite the advantages and use in clinical applications, the photoacoustic probe is not that popular in basic research: researchers need ready access to a $1 million ultrasound transducer connected to a pulsed laser, equipment not always on hand. Future Plans: The probe easily accumulates in tumor tissues because tumor blood vessels are leaky due to inflammation, Pu says. But it’s not so easy for the probe to cross the blood-brain barrier, something his lab is tackling next. Solution: Lin and colleagues engineered a two-photon fluorescent FA probe based on the condensation of a hydrazine moiety with FA. This unique strategy endows the probe with a very large turn-on signal, a low detection limit, and very fast onset, Lin says. These critical attributes enable the tracking of endogenous FA in living tissues for the first time at levels as low as 0.7 μM (normal in vivo levels of FA are closer to 29 μM) (Angew Chem Int Ed, 55:3356-59, 2016). Limitations: The probe exhibits good chemical and photostability. However, the maximum emission wavelength is only about 543 nm, which limits the probe’s detection depth. Future Plans: Lin hopes to continue developing more-stable and more-penetrant FA fluorescent probes for biomedical applications. Expert Tip: The probe concentration for optimal sensing and imaging varies by applications, Lin says. For cell imaging experiments, use 5–10 μM; for tissue imaging, Lin recommends using the probe in a higher concentration range of 5–30 μM. Problem: β-galactosidase (β-gal) activity is a well-known biomarker for aging cells and primary ovarian cancers. Although a number of fluorescent probes can help visualize β-gal in cell lines, very few can detect real-time enzyme activity in living animals—a critical ability for cancer diagnoses. “Precise in vivo tracking of enzyme activity is still challenging due to its dynamic complexity and intrinsic background noise,” says Guo. Solution: To get around some of those issues, Guo and colleagues developed a new β-gal sensor that works in the near-infrared range and lights up only when enzyme activity triggers the probe. The conditional fluorescence and the longer wavelength dampens background noise and autofluorescence, thus improving penetration depth for imaging. When researchers inject the probe intravenously, target cells brighten up in as little as five minutes, and the signal reaches a maximum at three hours. 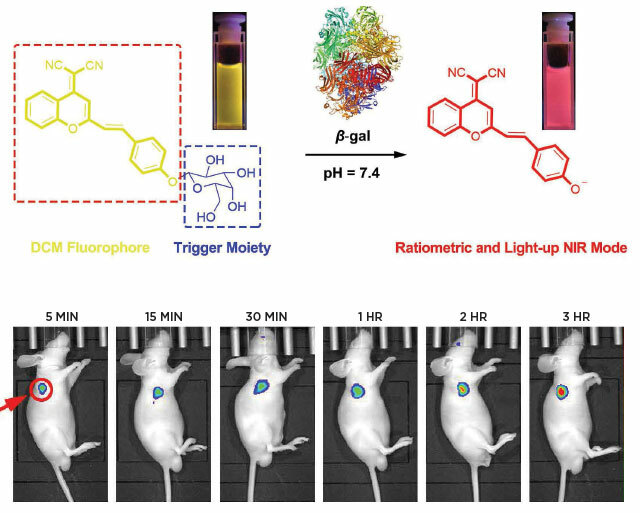 “The rapid response to β-gal activity at the tumor site enables real-time, in vivo imaging at high resolution,” Guo says (J Am Chem Soc, 138:5334-40, 2016). Limitations: Even though the probe fluoresces only in cells with active β-gal, there is no way to target it to specific tissues, Guo adds. The lack of a localization mechanism can ultimately affect probe accuracy. Future Plans: Guo and his team plan to directly address the drawback by developing a probe with better “active-targeting ability,” he says. Expert Tip: The probe is fairly straightforward to use, Guo says, but inject as close to the target site as possible for best results.